Gangsters of ‘Guys & Dolls’: (going clockwise from top) Todd Hilliard as Nathan Detroit, Keith Burritt as Big Jule, Jordan Christopherson as Nicely-Nicely Johnson, David Wilewski as Benny Southwest, and Seth Lambright as Angie the Ox. Considered by many to be the perfect musical comedy, ‘Guys & Dolls’ ran for 1,200 performances when it opened on Broadway in 1950. It received nearly unanimous positive reviews from critics and won a bevy of awards, including Tony Awards, Drama Desks, and Oliviers. Frequently revived, the show has been done with numerous all-star casts. The Main Street Players of Boone County are bringing this award-winning production to the Community Building, 111 W. 1st St. on Feb. 8 to 10 and Feb. 15 to 17. 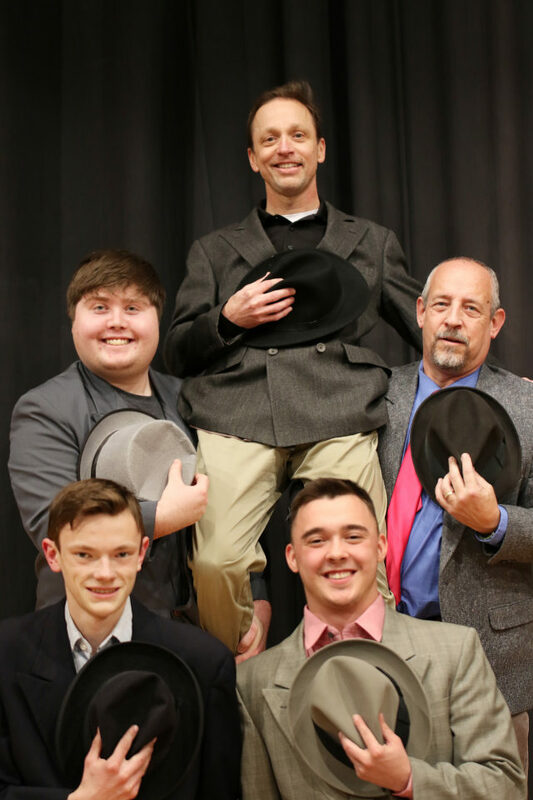 The performances on Fridays and Saturdays will begin at 7 p.m. and the Sunday matinees will begin at 2 p.m.
Based on Damon Runyon’s short stories and set in a mythical New York City, ‘Guys & Dolls’ is an oddball romantic comedy. Gambler, Nathan Detroit, tries to find the cash to set up the biggest craps game in town while the authorities breathe down his neck; meanwhile, his girlfriend and nightclub performer, Adelaide, laments that they’ve been engaged for fourteen years. Nathan turns to fellow gambler, Sky Masterson, for the dough, and Sky ends up chasing the straight-laced missionary, Sarah Brown, as a result. Guys and Dolls takes us from the heart of Times Square to the cafes of Havana, Cuba, and even into the sewers of New York City, but eventually everyone ends up right where they belong. Frank Loesser’s brassy, immortal score makes ‘Guys & Dolls’ a crowd pleaser. This show is a treat for audiences and performers of any age.